In Franchise Sales, this is often one of the first questions we get asked by prospective franchisees. The overall timeline can vary significantly depending on the individual or partnership group, with the steps leading up to a signed franchise agreement ranging from several weeks to several years. Once you sign a franchise agreement, however, the timeline becomes more specific. The average timeline to open a new Great Harvest bakery cafe once we have received a signed franchise agreement is 14 months. 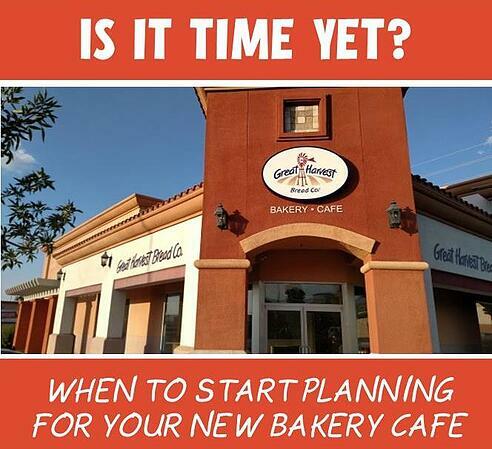 Here is a general overview of the steps you will take on the path to opening your new bakery cafe. It is never too early to inquire and begin doing due diligence on a franchise concept you are interested in. Some prospective owners are ready to get the doors open to their first location as soon as possible, while others are planning for small business ownership several years down the road. Depending on your personal circumstances and plans, we will work with your timeline and provide you with appropriate information and resources. If you want to move quickly, we will walk you through our sales process step-by-step. Depending on your availability, your due diligence can be completed within a matter of weeks. If you are planning for a business venture several years down the road, we will educate you on our franchise concept, keep in contact with you over time, and send you updated information as it becomes available. Do you have our new franchise information packet? Before we make a decision to award you a franchise agreement and before you make a commitment to sign that franchise agreement, we feel that it is important for us to all meet in person. During your Experience Great Harvest Day, you will meet with representatives from all of the departments that will be supporting you going forward. You will learn more about our support processes and systems and get to know our franchise team. Likewise, we get the opportunity to know you better on a personal level, understand your plans and vision for your Great Harvest bakery cafe(s), and evaluate whether or not we see potential for you to be successful within our system. We typically notify candidates about whether or not we will award them a franchise agreement the next business day after their Experience Great Harvest Day. As long as you have provided us with necessary details to structure your franchise agreement, you should receive that agreement within several days to a week following verification that you have been awarded a franchise agreement. There is a 7-day waiting period before you can sign and return the agreement. We provide you with a full 30 days to make a decision as to whether or not you plan to move forward with becoming a Great Harvest franchisee. The average timeline for your store opening once we receive a signed franchise agreement is currently 14 months. The biggest factors influencing this timeline are finding the right location, lease negotiations, and buildout. Once we receive a signed franchise agreement, you will immediately be assigned a Location Hunter and Tracker Trainer. The Location Hunter will work with you to find an approved location and assist with all lease negotiations. The Tracker Trainer will be your primary contact and will be working hand in hand with you through all planning stages for your first new bakery cafe. The Tracker Trainer will also arrange and schedule your training at the appropriate time to correspond with your opening. How Long Does it Take to Build and Open a Bakery? Exploring Great Harvest Bakery Ownership? Talk to Our Bakery Owners!